Motor Yacht Mary is in excellent condition and exceptionally spacious for her size, due to her generous beam. She is a luxury 68 ft Ferretti motor yacht, which combines comfort and style along with exceptional performance. Accommodates with comfort 8 guests in 4 spacious luxury cabins. Master & VIP cabins have double queen size berths and large en suite heads. Twin cabin has two single berths and shares the third head with the fourth cabin which has one upper and one lower bed All cabins are decorated with style and have quality bed linen, towels & accessories. Crew enjoy separate air-conditioned quarters at the stern, with their en suite. Motor Yacht Mary has a spacious fly bridge with a comfortable couch, a dining table and a wet bar. The large cushioned area is ideal for relaxation under the sun! 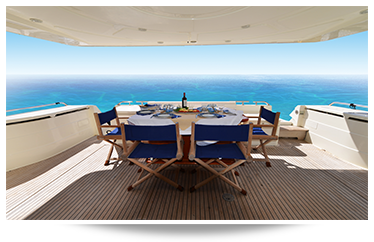 The teak aft deck offers a luxury table for al fresco dinning in style, while enjoying the magnificent views. TV, CD & DVD Players - Satellite TV NOVA - WI-FI, Tubes, Snorkeling & Fishing equipment (upon request, free of charge), BBQ option - (fly bridge) - Collection of CD's and DVD's,Inflatable tender boat 3.60m with 40 hp Honda outboard engine.